Located in the heart of Niagara’s wine growing region along the Beamsville Bench, Thirty Bench Winery grows premium grapes in the estate vineyards to help produce award-winning wines made in the Niagara Peninsula. The winery specializes in Riesling and classic red wines and uses the low-yield, high fruit intensity mentality to produce some of the best wines in the region. The skilled winemaker at Thirty Bench Wines produces each wine type in small batches to ensure that each wine is of the highest quality and flavour. The first vineyard was planted in 1981 and was the site for Riesling grapes. This type of grape is one of the oldest vines to grow in the Niagara Peninsula. By 1995, the first red grapes were planted including Merlot, Cabernet Sauvignon, Cabernet Franc and Pinot Noir. Further development to the vineyards came in 2000 when Pinot Meunier, Chardonnay, Gewurztraminer and Pinot Gris were added to the vineyards. 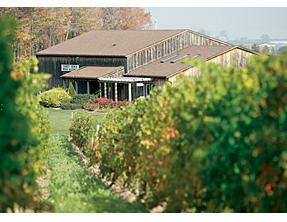 The four separate vineyards, Thirty Bench, Wood Post, Steel Post, and Triangle, amount to 57 acres of planted vineland. The custom made program offered at Thirty Bench Winery is perfect for the wine lover.The tour and tasting allows guests to take a flight of 4 wines for $ 10.